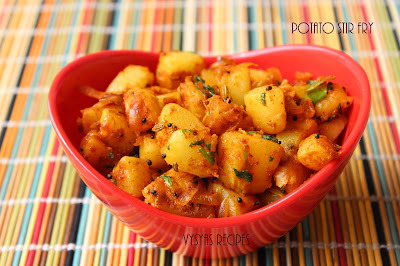 Potato Stir fry is an Easy and Yummy Side Dish Recipe made with boiled Potatoes and some Spice Powders. It Goes well with Chapathi,Roti, Rice, Rasam rice, Dhal rice and Mild Pulao's. I learnt this recipe from one of my Grand mother. Potatoes have high level of carbohydrates helps maintain good levels of glucose in the blood, which is necessary to proper brain functioning. Potatoes are packed with powerful nutrients and antioxidants—compounds, which are Good for health.Now we learn to make Pototo Stir fry. Potato - 3 (Medium Size). Green chillies - 1(slit into 2). Pressure Cook the Potatoes for 3 whistles, then remove the skin of Potatoes and chop the potatoes into cubes. Heat the oil, add mustard seeds, when it splutters add fennel seeds. When it sizzles,add slit Green chilles, saute till it turns pale. Then add chopped onions, & add Ginger garlic Paste. Saute till onions turns golden brown colour. Then add all spice Powders, such as coriander Powder,chilli powder,turmeric Powder, Garam Masala Powder and then add salt and mix well, and saute for a minute. Then add Cubed Pototoes and mix Gently. 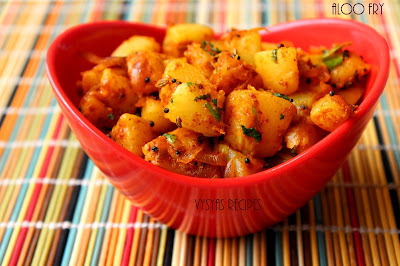 Saute for 5 minutes in a medium low flame till masala's are well blended with Potatoes. Adding Fennel seeds,gives nice flavour to Potato stir fry. Don't saute spice powders for longer time, else Powders become dark. After adding cubed potatoes mix it gently else, there might be a chances of breaking potatoes. you can also add 1/2 tsp of cumin powder,while adding other spice powders. For more Veg curries/subzi's plz visit 24 Curry Varieties. All time fav!! looks super tempting and simple! !